Ms. Becker is a pressure vessel design engineer for The Babcock & Wilcox Company in Barberton, Ohio. 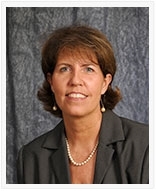 She is a member of the National Board Advisory Committee, representing boiler manufacturers. She is also a member of the American Society of Mechanical Engineers (ASME) and is the Secretary for Subgroup Fabrication & Exam as well as a member of Subgroup General Requirements & Piping in BPVC Section I. Ms. Becker has over 30 years of work experience as a patternmaker and design engineer.